It has been nearly 13 years since Baltimore lost its own legendary public address announcer. Rex Barney, the man who made “Give that fan a contract” and “Thank Youuuuuu” as much a part of every local fan’s summer as a trip to the Eastern Shore, died on Aug. 12, 1997. 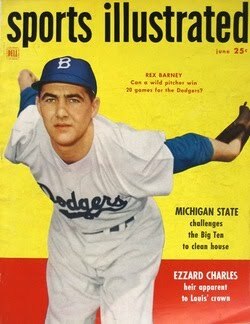 Barney moved to Baltimore in 1965 after then-Orioles GM Lee MacPhail encouraged him to do so. He started working Orioles games as a fill-in public address announcer in 1967 and took over full-time duties in May 1973. His tenure included stays at both Camden Yards and Memorial Stadium, where he delivered a “Thank Youuuuuu” following the team’s final game there in 1991 from a hospital bed. Having been hospitalized with exhaustion, he made the appearance on the stadium Jumbotron. The Orioles paid tribute to Barney on Aug. 12, 1997, by playing their 8-0 victory over the Athletics without a PA announcer. Stadium flags were flown at half-staff and a plaque bearing Barney’s uniform number with the Brooklyn Dodgers, 26, was unveiled behind his traditional press box seat, where a scorebook and Dodgers cap rested for the evening. “Some take great talent and squander it. Some are haunted by what might have been — if only they or their world had been ever so slightly different. A very few, however, have the almost saintly capacity to accept life exactly as it is, complete with all its disappointments and malicious ironies. They take the ball and then, as the old-timers say, they’re ‘in there for nine.’ No bullpen, no relief, no complaints. Barney was knocked out of the baseball box for good when he was still just a kid. He had a no-hitter against the Giants and a couple of losses in the World Series, plus a perfect opportunity to chew on a mouth of sour grapes all his life. -Myrtle Farinholt, Camden Yards custodian. Related Reading: Cabrera’s like one of Dem Bums.